Kira is a 15 year old who didn’t like smiling. 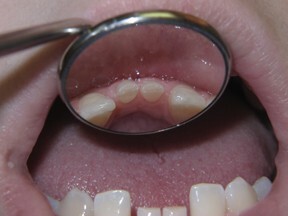 She had several baby teeth which did not fall out; there were no permanent teeth to replace the baby teeth. Occasionally, one or a few permanent teeth just don’t develop, so there is nothing to shrink the baby teeth roots and push the baby teeth out of the mouth. Also, Kira’s upper permanent teeth were small and misshapen. So a broad smile was becoming an embarrassment for her. 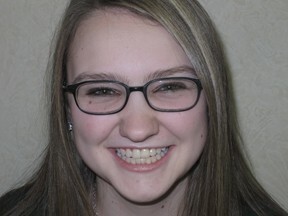 Kira’s orthodontist, Dr. Ali Husain, placed her teeth in their ideal positions. Because her upper teeth are small, and her baby teeth are tiny, we decided to place composite resin bonding on all the teeth requiring new shapes and more pleasing appearances. 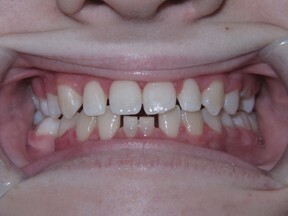 This type of bonding is called a Chairside Resin Veneer as opposed to a Laboratory Manufactured Porcelain Veneer. It is formed freehand by the dentist whereas porcelain veneers are formed, after taking impressions, in a dental laboratory. Chairside veneers can be made when there are no large cavities or fillings in the teeth, when the patient is too young for porcelain veneers, when finances are a major issue and/or when we want a reversible procedure. Chairside veneers are a difficult and demanding procedure, so a skilled and experienced clinician is essential. Despite the difficulty involved, they are usually half the cost of a porcelain veneer since there is no laboratory involvement and expense. 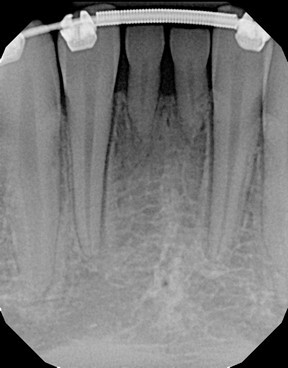 Here is the x-ray of Kira’s lower front teeth. Notice how small and how short the roots of the two front baby teeth are. You can see that there are no permanent teeth below the baby teeth. Obviously, the roots of these teeth are not long enough for her to keep these teeth forever. Eventually, the baby teeth will either get loose or have to be removed. Implants can then take the place of the missing teeth. Because of Kira’s young age, her bone is still growing and changing. Implants need stable bone, so they are not a good choice at this time. This photograph demonstrates the need for accurate planning, measurements and deliberationbefore the patient has any treatment started. 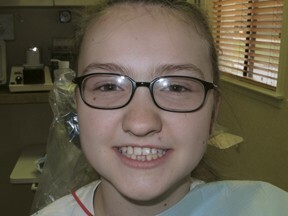 Here is Kira on the day that she had her braces removed. 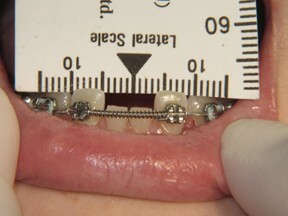 We had to immediately place her bondings so that a retainer could be fabricated as soon as possible, preventing regression and relapse of the bite. It is obvious that we had to coax her to give us a big smile for the photograph. 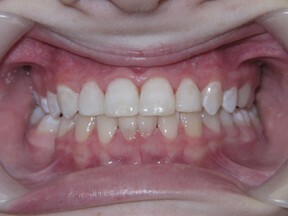 The teeth receiving the composite resin bondings were her upper front six teeth, the retained baby tooth on her upper left back baby tooth, and on the two lower baby teeth. Because the lower front baby teeth are so small, we needed to bond the two teeth together to obtain maximum retention. We also left her bite very light on these teeth in order to avoid excessive bite forces. If you think that you or a friend or family member would benefit from this type of procedure, please give us a call to arrange an appointment.